Cappadocia in Turkey has a surreal landscape fashioned by ancient floods and winds that partially eroded a volcanic based plateau. 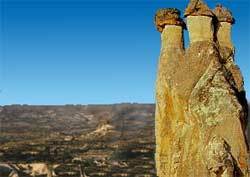 This process created numerous fanciful formations including the conical towers nicknamed fairy chimneys (see photo). Viewing these fanciful formations inside, up close, and from afar gives you the impression that you are on a far-flung moon. The Cappadocia rock formations are relatively soft textured. This attribute led to habitation, which peaked in the 10th and 11th centuries. Fleeing persecuted people (mainly early Christians) carved dwellings and churches into the formations. The new arrivals also dug into the many canyon cliff walls to produce multi-story communities reached only by ladders, steep foot paths and treacherous footholds. Today, some Cappadocia inns rent the primitive rooms (with modern amenities added). I got a thrill sleeping in one, realizing that it was hollowed out by its earliest inhabitant nearly a thousand years ago. Cappadocia offers a host of other interesting experiences, including touring the underground city of Derinkuyu. Local inhabitants temporarily hid in the subterranean Derinkuyu while invading armies marched overhead. This human warren has intricate room mazes going down eight levels. Concealed wells, air shafts and food supplies made it self-sufficient for long durations.